IT was not his real name, but the entire community knew him as Jangwa. If a child misbehaved during those days, elders would threaten that they would call Jangwa “to deal with you”. That name would send shivers down the spines of the innocent little ones. Jangwa was a mortuary attendant for many years at the local hospital, but children knew him as the man who took dead people and ate them. The mere mention of his name was extremely scary! But in real life, Jangwa was a decent and loving family man with beautiful and intelligent children. He would not hurt a fly. A hundred kilometres away, in the rural district of Zaka, there was Chitanduro. He was known for moving around villages singing and loudly beating an African drum, which was held by a long dirty strap round his neck. He had some missing front teeth and would never miss an opportunity to show the gaps, as he forced a smile from time to time. For unruly children during that time, when parents or elder siblings could not put up with our energy levels, they would simply shout “Hokoyo naChitanduro – Here comes Chitanduro!” It was like being told that a lion was just about to devour you! Elders would warn us that if we did not behave, they would invite Chitanduro, who would put us one by one into his drum and do the singing for him from inside that drum around the villages. The imagination of being in that drum was worse than a nightmare. As we grew older, we learnt that Chitanduro was a harmless man who was only suffering from some kind of mental illness, just as we learnt that Jangwa was like any other parent. What reminds me of these two bogeymen are events of the past 37 years, particularly the last three years when Zanu PF went overdrive into self-destructionmode. As a nation, we had become so scared of President Robert Mugabe that we could not say anything about him, no matter how wrong he was. In the past, some including a former mayor of Harare, Tony Gara and lately Kudzanayi Chipanga equated Mugabe with Jesus. Others thought Mugabe was a super intelligent human being who knew everything, was always right and could not be challenged by anybody. Even today, there are those who are too scared to say anything about Mugabe except to praise him. These are the crazy Jangwa-Chitanduro moments that our nation must outgrow. For how long shall we run away from a bogeyman? When Margaret Dongo, those many years back, said that Zanu PF ministers and MPs were Mugabe’s wives, others wanted to beat her up. Nathan Shamuyarira threatened Dongo with harm but she hit back and said she would dance on his bald head. In hindsight, Dongo’s observation was probably right. Over the years, Mugabe reduced all his ministers to mere secretaries and sycophants, whose primary role is to sing praises for the master. 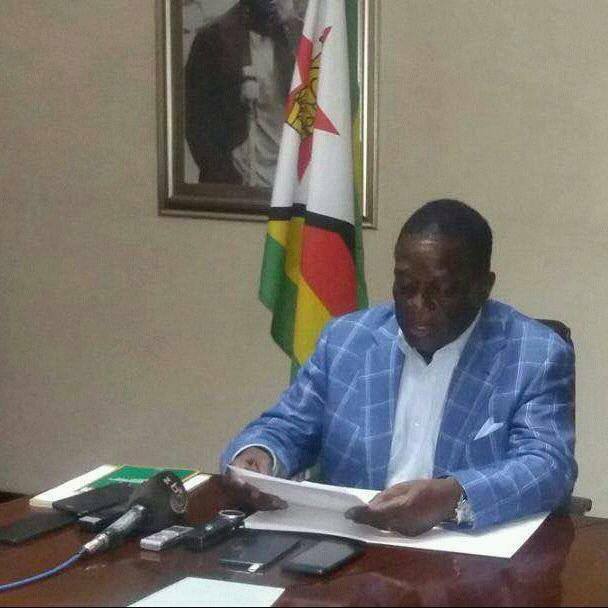 If Vice-President Emmerson Mnangagwa is not a bogeyman, sycophant or one of Mugabe’s wives, this is the perfect time for him to rise to the occasion and show Zimbabweans what he is made of. More than enough has been thrown at him. Now there is nothing to lose or wait for. I do not support anybody in Zanu PF. Nonetheless, when a politician is attacked because of their tribal origin, it naturally attracts my attention and sympathy. I am neither an admirer nor a supporter of Mnangagwa but, if he is attacked by Mugabe and his wife or anybody else because he is a Karanga who should go and form his own party for Masvingo and Midlands, I am left with no option but to leap to his defence. General Josiah Tongogara was a Karanga, Air Chief Marshal Josiah Tungamirai was a Karanga, Sheba Gava (General Vitalis Zvinavashe) was a Karanga, Vice-President Simon Muzenda was a Karanga — they did not fight for Masvingo or Midlands. They all fought for Zimbabwe. They must be turning in their graves, and understandably so. Zimbabweans must never discriminate between one another because of ethnicity. And we must never allow the Mugabe family and a few of their cronies to divide us on dangerous tribal lines. We must stand together despite our differences and say no to political madness and desperation, which is now taking the dangerous form of tribalism. Mugabe’s interface rallies (a euphemism for farewell/succession rallies) must not be the platform to set us against each other. While we have been politically polarised for decades, nobody must leave behind a nation in tribal turmoil. We do not want to be another Rwanda just because one family thinks it owns Zimbabwe. To our war veterans, all I can say is that there is no wrong time to do the right thing. After all, puppies do not open their eyes on the same day. Come along and let us confront the monster together. Let us build a critical mass to throw the pipe-dream of a dynasty into disarray. Events between now and January 2018 are likely to unmask which of Mugabe and Mnangagwa is merely a bogeyman. In the meantime, the opposition must seize this moment and make the most out of it.